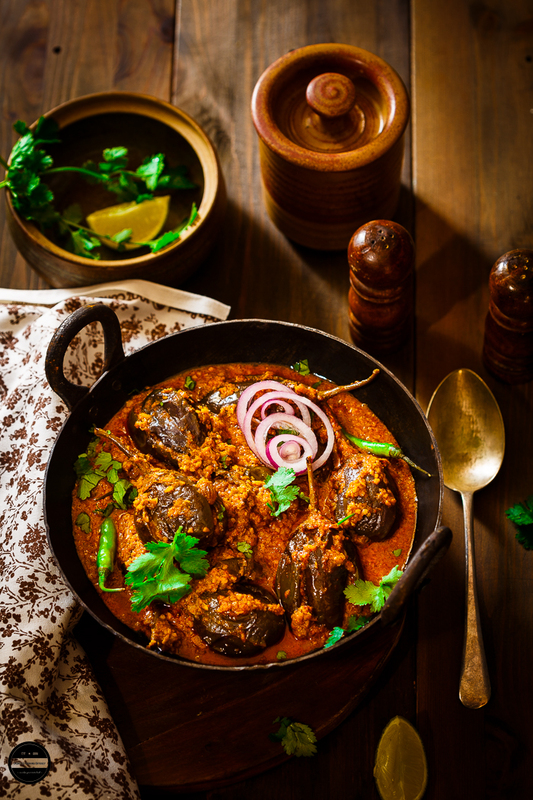 Baingan Bhatinda Masala, A delicious curry prepared with purple round aubergine, cooked with freshly ground garam masala with basic ingredients. A perfect spicy and finger licking curry that goes well with roti or rice. Since I was a little girl I took lots of interest in food, maybe not in cooking. While at home I was always so curious about what my mum was cooking and how was she cooking. While playing in the front garden or playing at friends house I could always smell other neighbours kitchens. I was always interested in what my friends brought in their lunchbox and tell my mum at home what they were eating. I'd ask my mum and my friends how the dish was made. When we didn't have a TV, I would look at recipes in local newspapers and jot them down in my notebook. Even if I didn't always plan to make these recipes, I still always wrote them down. I always found some pleasure in writing down the recipes. And once TV entered into our house, again my interest in cookery programme spiked and I would still note down recipes. The pleasure from cooking these dishes in the kitchen after was something else. The recipes didn't always turn out great, and if I wasted money on the ingredients, I'd get a slap from my mum but it never stopped me from trying. Sometimes, I watch cookery channels in other languages and just follow what they do onscreen! My family are so used to this by now, that if they are browsing the tele, they will automatically put the cookery show on record for me! A couple of years back husband was going through Sky and he spotted something, and recorded the programme for me and asked me to watch it in the morning. The programme was called Turban Tadka. All of his recipes were so easy to make, quite rustic and day to day recipes without any such an expensive ingredients or tedious methods. In one of his programmes was this recipe for Baingan Bhatinda. I told my husband no wonder you recorded this programme for me, he said as soon as I saw that guy was preparing something with aubergine I thought of you :) I am so happy because this Baingan Bhatinda I am going to prepare today and I did. Everyone in the family enjoyed it even my daughter ate whole one aubergine herself! She normally isn't a fan. Since then I have prepared this dish numerous times and every time loved it but never made it up to my blog, but today I am going to sing all about this Baingan Bhatinda. 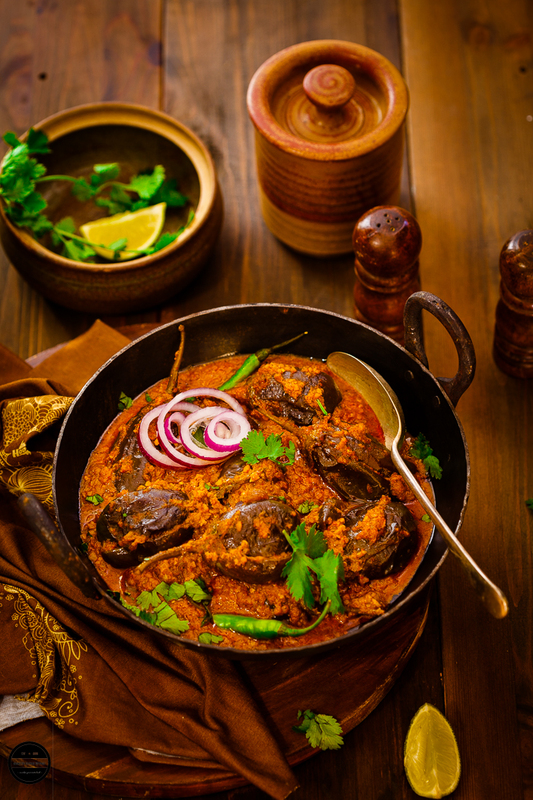 Bhatinda Baingan Masala, the name suggests that this dish has some connection with the city Bhatinda in Punjab India. 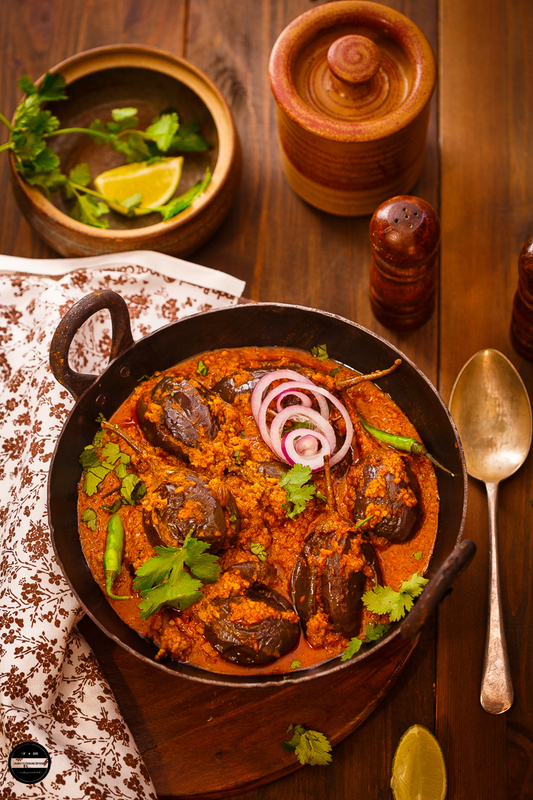 In this recipe, whole round aubergines are cooked in roasted aromatic spices and onion gravy. It is a straightforward recipe and can be made in a few ticks. 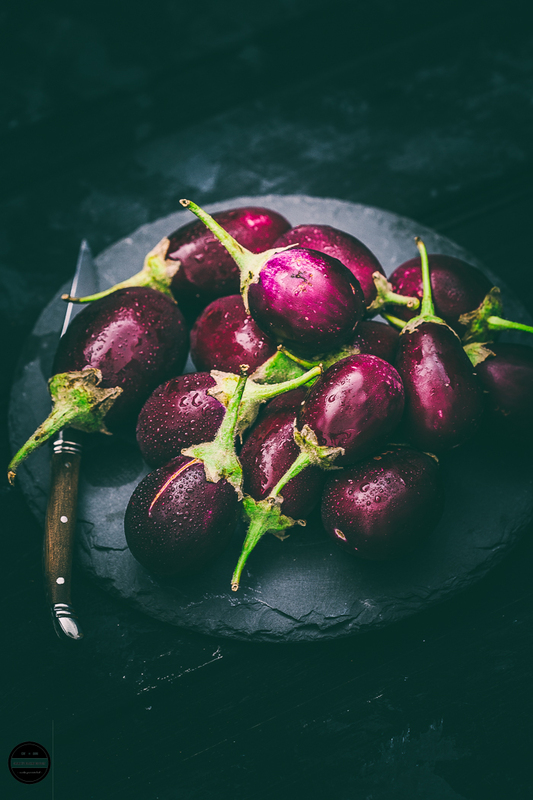 This easy and delicious aubergine curry is prepared with whole purple aubergine and cooked with freshly ground spices and onion gravy. Dry roast whole spices for a while and let it cool down.Coarsely grind in a grinder and leave it aside.Fill a big bowl with cold water and add pinch turmeric and mix it well.Slit all the aubergines and submerged in turmeric water. This process will stop the aubergine going dark.In a big kadai heat oil and add onion and fry till it turns light brown. Add ginger-garlic paste and fry for few minutes.Now add red chilli powder, turmeric powder salt and mix well.Once you see oil separating the masala add slit aubergines and green chillies.Mix well and add little water.Cover the kadai with a lid and cook the curry till done.Once done, sprinkle ground spices and mix well.Serve on a serving plate and garnish it with the freshly chopped coriander.Serve with roti, rice and salad for a complete meal.Enjoy! Wooowwww what a photography dear.. Curry looks amazing.. feeling hungry.. I just love stuffed vegetables.. I always make stuffed brinjal in Jain way, will surely try ur recipe sometime..
Wowwww mouth watering. Very nice dish. Wow!! What a beautiful click!!! Baingan made this way is appetizing any time :) :) Thanks for sharing! Such a delicious curry:) Love eggplants in any form! What gorgeous pictures - it’s majing me hungry. Btw it’s one of my favorite dishes. Beautiful clicks and love the way the sabji is prepared. Slitting the aubergines allows the gravy to get inside it. I remember when I too would note down all interesting recipes in my huge old diary that my dad had given me. Those were the days Jagruti. I don't think now anyone jots down recipes. I still do! Mouthwatering pictures and these are my favorite curry! Bhaingan is my favorite veggie and your Bhatinda baingan masala is tempting me to make this soon. Will have to look for some baby eggplants now. Can't wait to make this curry ASAP. Looking at this My heart bole Balle Balle.... It looks so lip smacking dear. 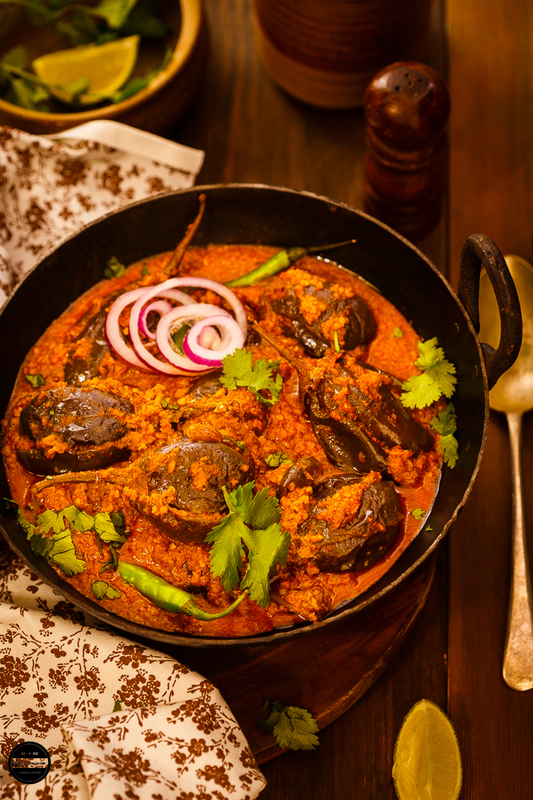 Breath taking clicks and those baingan masala curry is absolutely irresistible, drooling here. Turban Tadka I think I followed him for some time. His recipes were great. I love this addition to my scant baigan bhaji collection. It sounds delicious. Looks really delicious! Love your tip on preventing the aubergines from darkening! I've printed it out to try tonight. The curry looks absolutely lip smacking and I am in love with the clicks. Looks so tempting. This sounds like a lovely dish.I too used to watch that programme and his recipes are really homely. The curry looks awesome .. I love the show Turban Tadka and the way Chef Harpal Sokhi presents it in a jovial manner. couple of years ago I was invited by him as a guest in his show but by the time shooting started I left for Brazil. There I feel you are like me. Even I , Since my childhood have been collecting recipes. I just love stuffed brinjals and yours is looking scrumptious.